Many companies thus fulfilled their noble pledge to benefit the public. They also made a tidy fortune for their founders and managers. William Henry Franklin (1848-1907), who founded the Public Benefit Boot Co, left £78,000 (over £8 million in modern terms) on his death. He established his business in Prospect Street, Hull in 1875. By the time it merged with Dickinson Bros (of Bramley, Leeds) in 1897, it comprised 51 shops and a factory in Wellingborough. 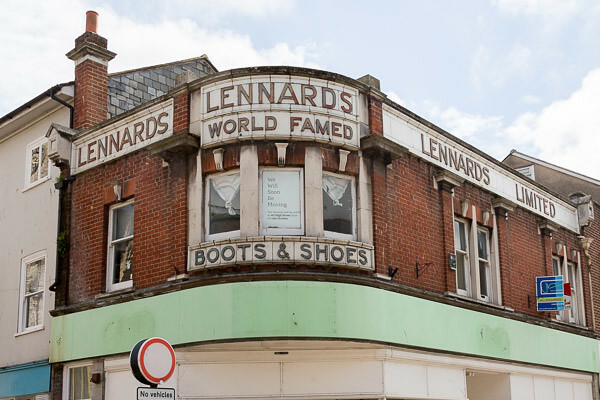 In 1904 the Public Benefit Boot Co struck a deal with Lennards (see below), which was trading under the same name in the south of England. The shopfronts of the two firms, with their large plate glass windows, were very similar. By 1920 there were 143 Public Benefit Boot Co shops (11 of them freehold), mainly in the north and Midlands. In 1946 the company and its shops were renamed Benefit Footwear Ltd. Through amalgamation with the merged Saxone and Lilley & Skinner (1957), it passed into the hands of Charles Clore’s British Shoe Corporation in 1962. The date on which the last ‘Benefit’ shop closed is not known. At least one of this company’s shopfronts survives, at 13a Saville Street, Malton, Yorks. Others are possibly unrecognised because they have lost their mosaic tiling and other obvious branding. Quite a few historical postcards of British town centres highlight branches of the Public Benefit Boot Co and could well have been commissioned by the firm. Lennard Brothers was founded as a boot and shoe manufacturing firm in Leicester in the 1870s (incorporated 1897). The prime mover seems to have been Samuel Lennard (1851-1901), who opened his first factory on Crafton Street in 1876, later moving to Asylum Road (subsequently the site of the now-demolished Liberty Building). Branch factories opened in Kettering, Northampton and Blaby, and a warehouse in Leicester. Samuel married the daughter of Edward Wood, the Chairman of Freeman, Hardy & Willis. Some of Samuel’s brothers were more engaged in retailing. In 1897 Thomas Lennard (1861-1938; knighted 1920) moved to Bristol where he established Lennards Ltd in new headquarters on Queen Street. In 1904 Lennards Ltd – with 104 branches trading as the Public Benefit Boot Co – reached an agreement with the Public Benefit Boot Co of Leeds (see above) to form a new company embracing both concerns. Whilst Lennards’ shops were concentrated in the Midlands and south, those of its Leeds namesake were largely in the Midlands and north. Before long, however, Lennards’ shops were trading under the ‘Lennards’ name. By 1909 Lennards had 130 shops, and by 1920, when the freeholds were transferred to the Lennards Real Property Co Ltd, it had 200, a number it never greatly exceeded. In this period the pilasters framing the shopfronts had panels engraved with the locations of principal branches, and the low stallrisers displayed the Lennards name. In 1923 an important new store was built on Edgware Road, London, designed by Bridgeman & Bridgeman, with a cupola over the canted corner bay. The discreet ladies’ fitting room to the rear of the shop was warned by a gas fire. In 1929 the 50 or so shops of Alfred Tyler & Sons of Leicester – mainly situated in northern towns and cities – were acquired and reorganised, and in 1938 Lennards moved into new headquarters on Soundwell Road, Staple Hill, Bristol. Lennards failed to buy back its properties in 1952, losing them to Lombard. The company developed subsidiaries abroad, notably in Ghana and Nigeria and acquired Smart Shoes Ltd in 1970. Lennards was bought by Great Universal Stores 1973 and then (with 260 shops) by Charterhall in 1989. Charterhall went into receivership shortly afterwards, and the shops probably closed in 1991-92. Public Benefit Boot and Lennards were sizeable companies and lasted for a very long time dealing not only in this country but also abroad via the postal system generally. Just cleaning up in our garage and found a metal shoe horn with The Public Benefit Boot Company inscribed together with the boot cart logo. Very interesting history. On renovating our Cafe in Swansea we uncovered a sign that reads Lennards Boot and Shoe Manufacturers so we kept it and some of the lovely stained glass windows (which are framed inside the shop). We decided to name it The One Shoe Cafe with a nod to its past, and have a tiny wooden shoe last framed inside. We have been given a photograph of the shop when it was the Public Benefit Boot Company, circa early 1900’s if you would like to see it. Kirsty Hill.